Follow me on Twitter or Facebook to stay up to date with news about SonicWebs. SonicWeb is an advanced internet radio player and recorder. It is an universal app and runs on Windows 10 and Windows Mobile. Choose from more than two thousand free, hand selected, high quality internet radio stations. The radio station database is updated and enhanced constantly. It contains only stations that play music in high audio quality. If you are missing a radio station let me know and I will add it quickly. You can also add radio stations yourself directly in SonicWeb. SonicWeb contains all features you would expect from an internet radio player. Browse popular and recommended stations, filter by genre and bitrate, search by name and genre and set favorites. 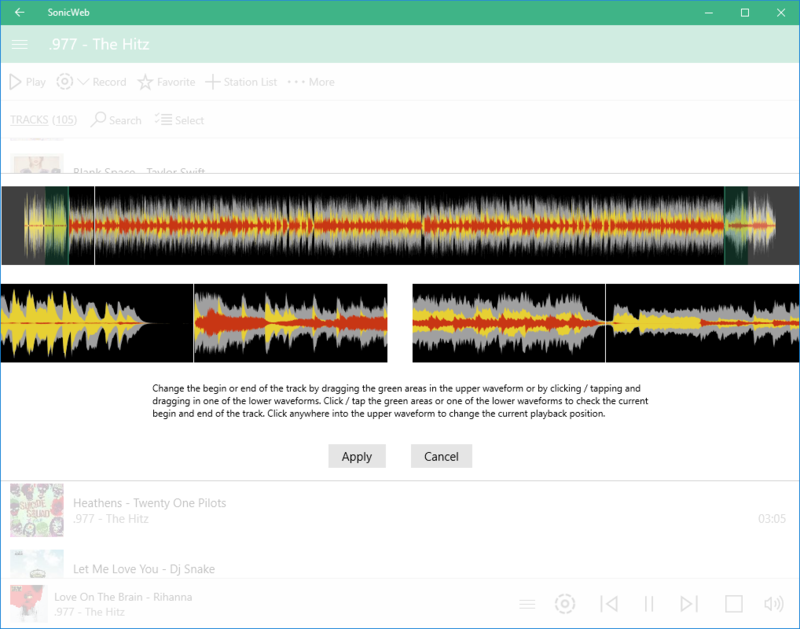 Record internet radios continuously or record and let SonicWeb split the recorded streams automatically into tracks. Timeshift internet radio: pause and resume playback at any time, without any gaps. 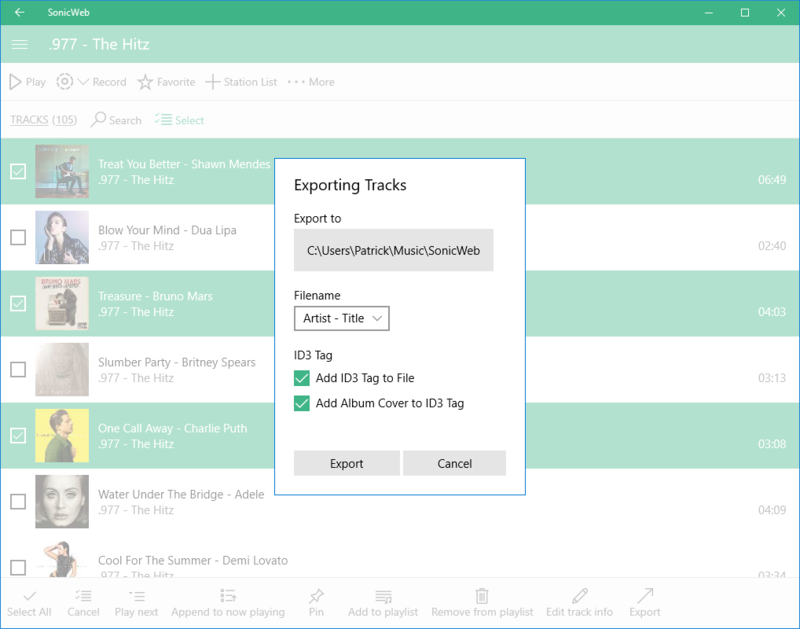 You can create custom playlists from the tracks you like. Keep them as long as you want and play them as many times as you like. If needed fine tune the start and end of tracks with the builtin trimming functions. Export recordings into files to use them with any player. 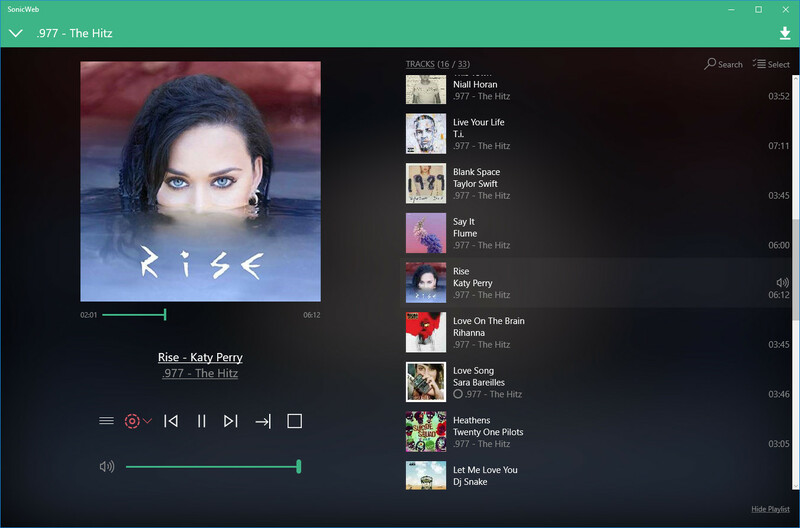 Build your own music library with the tracks you like the most. Copy them to your mobile devices to listen to them on the go. 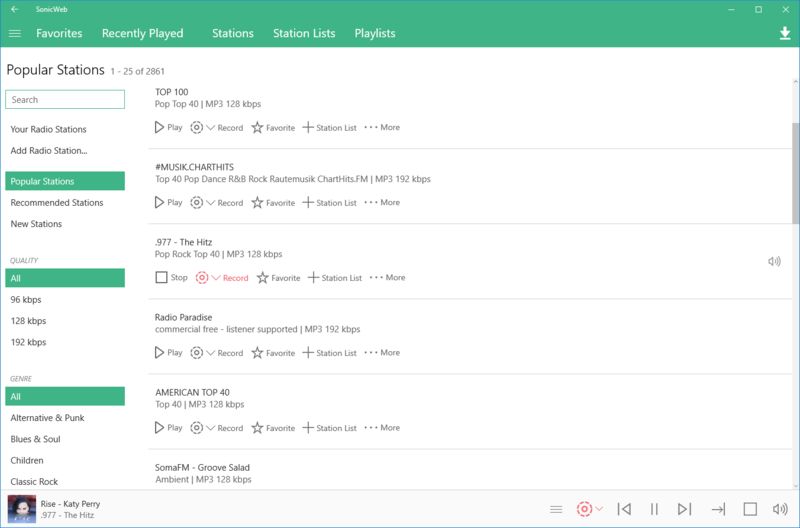 Station lists record tracks from multiple radio stations simultaneously. SonicWeb automatically splits the radio station streams into separate tracks and adds them to a common playlist. 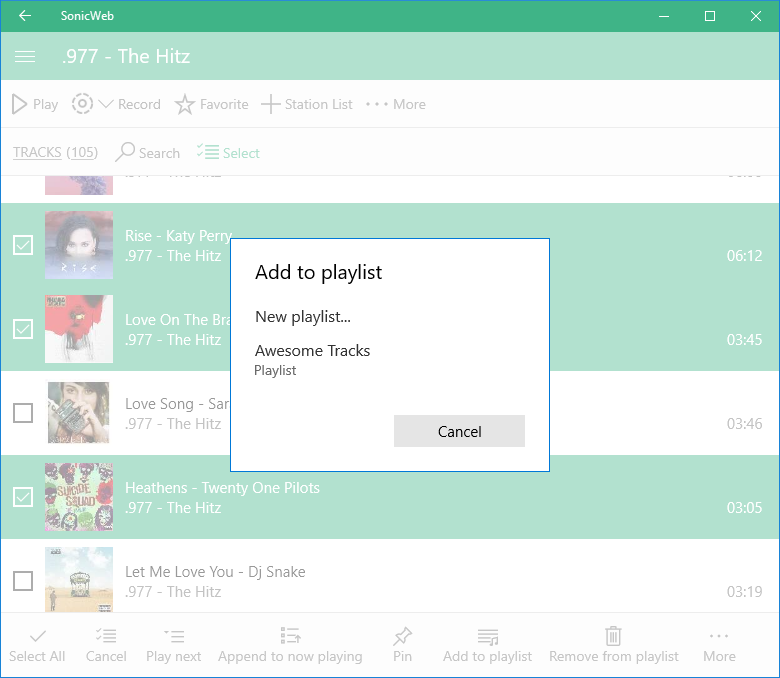 You can define as many station lists as you like and switch between them, regular internet radio stations and custom playlists at any time. With several simultaneously turned on radio stations the common playlist will quickly contain many unplayed tracks. This enables you to skip tracks you don't like without any skip limit as long as there are more tracks available in the playlist. Audio playback is gapless with tracks from different radios stations crossfading into each other. SonicWeb dynamically adjusts the volume of loud and silent tracks so that you don't have to. These features together enable uniform and seamless audio playback just like with a regular radio station. 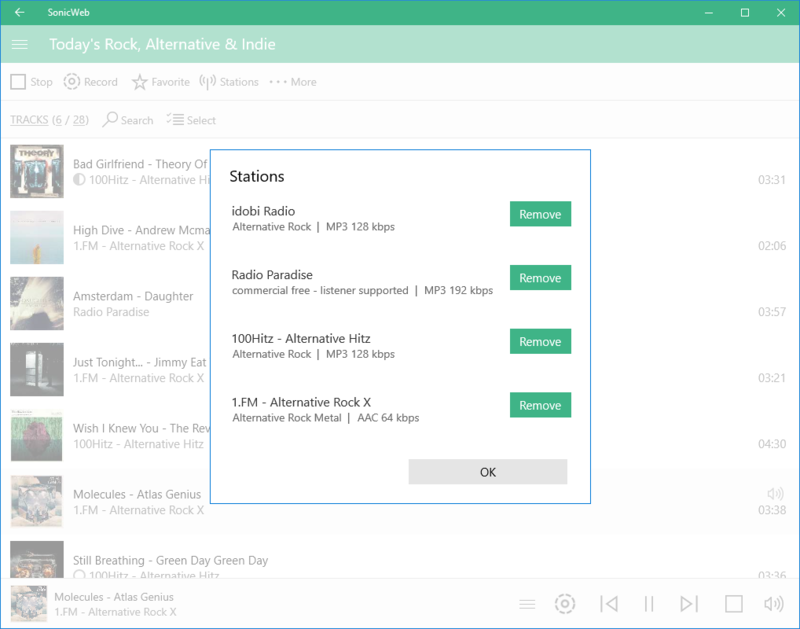 In combination with station lists SonicWeb will automatically create your own, personal radio stations that you can control just like a regular media player.